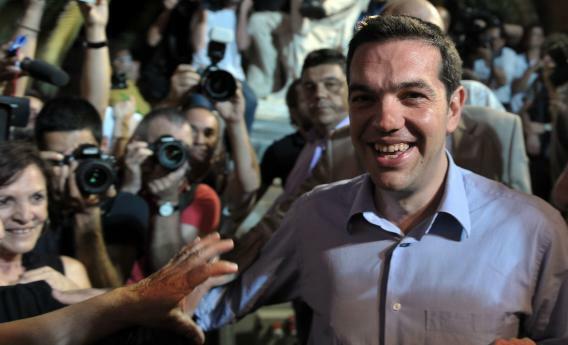 Leader of the radical left Syriza party Alexis Tsipras greets supporters after a speech outside the University of Athens, on June 17, 2012. Greece’s two main pro-bailout parties clinched enough votes to form a government in a cliffhanger election on June 17, early results showed, easing fears the country will crash out of the euro. Eurozone countries extended on June 17 a hand of compromise to Greece after the victory of parties supporting the country’s international bailout, signalling some flexibility on the painful reforms. French Socialists won a convincing majority in the runoff parliamentary elections there Sunday, handing President-elect Francois Hollande the governing majority he needs to effectively challenge Germany’s Angela Merkel on austerity in the European Union. David Plouffe, Obama’s 2008 campaign co-chair and the top strategist working in the White House, thinks Democrats should quit their handwringing about his message on the economy. To beat Obama, Romney may have reach Ronald Reagan’s 1984 landslide support among the white working class. Rodney King, whose beating touched off the 1992 Los Angeles riots, was found dead at his home this morning. Alec MacGillis has a moving portrait of the legions of Americans whose lives might be saved by the health law – if they knew about it (and if the Supreme Court doesn’t overturn it). And the pro-bailout, pro-European Union coalition seems to have eked out a win in Greek elections, though as Yglesias notes, governing right now isn’t going to make anyone popular.